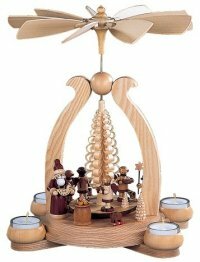 these traditional Christmas time wonders are crafted of fine hardwoods. 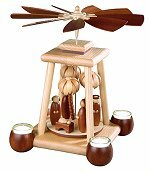 a handful of German wood turners produce these delicate wooden creations. Müller, Flath, Ulbricht, Richard Glässer, Kunth Neuber and KWO. Candle Arches which may be found here: Candle Arches - Schwibbogen. 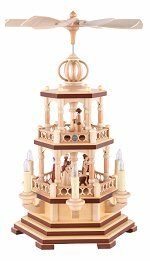 This over-sized natural pyramid will adorn your holiday decorated entrance or living room with a dramatic yet old European image that will impress your holiday guests! 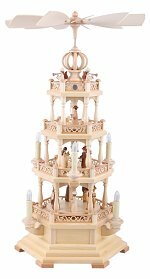 Depicting the Christmas Nativity Story with large removable figures, is this five tiered natural wood finished pyramid made in the workshop of Ringo Müller of Seiffen, aus dem Erzgebirge, Saxony, Germany. The roof or sixth layer is finished with an infinity dome just below the blades. Ringo Müller is considered perhaps to be the premier Christmas Pyramid maker from the Ore Mountains, and was featured by Martha Stewart during her Christmas Special several years ago. Due to size Local Pick up Only Made in Germany by Kleinkunst aus dem Erzgebirge Müller GmbH Seiffen, Saxony. 59 inches - 150,0 cm 70 inches - 178,0 cm - With Base! 110 Electrical illuminated and driven An optional natural beechwood laminated base raises the pyramid an additional 28cm off the floor - 11 inches. Large Six-sided Base No Shipping Available Pick up in our store ONLY!